Marking a milestone achievement in the global effort to make scientific collections widely available online, The New York Botanical Garden recently added the two-millionth plant specimen to its digital research collection, part of an ambitious project to digitize the 7.3 million dried plant specimens in its William and Lynda Steere Herbarium, the largest herbarium in the Western hemisphere. 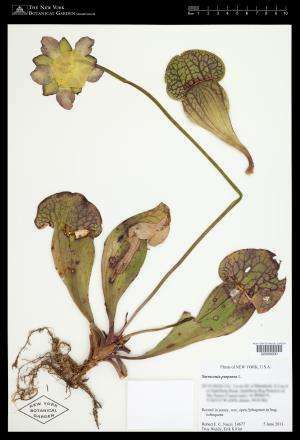 The two-millionth plant to be digitized is a purple pitcher plant, a very rare native carnivorous species (Sarracenia purpurea) that was collected at a highly protected preserve in Dutchess County, New York. The specimen was digitized under a grant program administered by the National Science Foundation (NSF) called Advancing Digitization of Biological Collections, which is currently funding six projects at the Botanical Garden. That includes a four-year grant awarded in July for the Garden to digitize 200,000 algal specimens and manage the data portal for a total of 1.1 million digitized algal specimens at 48 American institutions. The NSF's goal is to make the majority of biological collections in the United States available online by the year 2020. 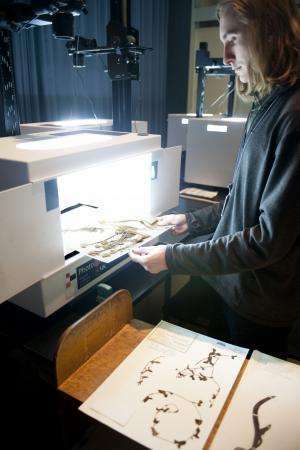 "The digitization of the two-millionth specimen is significant not only because we are now almost one-third of the way to our goal of digitizing the entire Herbarium but also because we are now able to digitize specimens so quickly," said Barbara Thiers, Ph.D., Director of the Steere Herbarium and a member of the task force of scientists advising the NSF on the national digitization initiative. "We have worked very hard over the past few years to streamline our procedure so we can digitize faster, and we have succeeded. As a result, many of our unparalleled collections of plants from North and South America and the Caribbean are now easily available to researchers and the general public." Until now, researchers who wanted to study a plant specimen in the Herbarium have had to travel to the Garden or request that a specimen be sent to the researcher on loan, resulting in wear and tear on the specimen, which can be hundreds of years old. The Garden's collection of specimens is an irreplaceable source of data for such current research issues as climate change, loss of biodiversity, evolution, discovery and description of new species, agricultural development, and the impact of natural disasters. The first step in digitizing a specimen is to photograph it at the Garden's Digital Imaging Laboratory, where specially designed light boxes assure uniform lighting of the specimen sheet. The high-resolution images are so detailed that they are almost like looking at a plant through a microscope, but digitization means more than simply taking a picture of a specimen. The process also entails recording all of the information on the specimen sheet such as the species name, when and by whom the plant was collected, and the habitat where it was found. The information on the sheet is read using optical character recognition (OCR) software, and then, after it has been checked for accuracy, it is made available in a searchable database. The digitized images and the database are available through the Garden's C. V. Starr Virtual Herbarium. Innovations in processing specimen images and data have greatly increased the pace of digitization at the Garden. Dr. Thiers notes that it took 12 years to complete the first million specimens in the Herbarium; the second million took only half as long. Herbarium staff members are now digitizing 300,000 specimens a year. They have also led training workshops at many herbaria and universities across the country to speed the pace at which botanical collections nationwide are being digitized. NSF funding is currently supporting six digitization projects at the Garden. One entails digitizing the Garden's estimated 300,000 plant and fungal specimens from the Caribbean region, the world's most extensive botanical collection from this region. Another involves the Garden's collection of Brazilian plants, one of the best representations of that country's plant life. Other projects focus on the Herbarium's specimens of mosses, lichens, algae and macrofungi (mushrooms and other large fungi), all of which play crucial roles in the environment. In addition, the Garden has played a lead role in planning and carrying out the Global Plants Initiative, which is working to digitize all of the known "type specimens" in the world. (These are the specimens that serve as the reference point for defining a particular species.) To date, the Garden has digitized about 140,000 type specimens out of an estimated 150,000 in the Herbarium as part of this project, which is funded by the Andrew W. Mellon Foundation. The purple pitcher plant specimen was digitized as part of a collaborative NSF-funded effort involving 34 museums in the United States to create a uniform record of North American plants, the insects that feed upon them, and the parasitic wasps that attack many of those insects. The Garden is coordinating the botanical component of the project, which involves 14 participating herbaria. The pitcher plant, which favors wet soil, was collected at a Dutchess County wetland preserve in June by Garden scientist Robert Naczi, Ph.D.; Troy Weldy, Director of ecological conservation for The Nature Conservancy, which owns the preserve; and Erik Kiviat, Director of Hudsonia, an environmental research institute in Annandale, New York. They are studying plant populations in the Hudson Valley region to document the decline of native species and identify ways to conserve them. Flies, ants, spiders and other prey fall into the base of the plant's tubular leaves and drown in the rainwater that collects there. The plant gets its nutrients from the prey, which are digested mostly by bacteria. "The purple pitcher plant is the signature plant of bogs in the Northeast," said Dr. Naczi. "It is immediately recognizable and was one of the first native North American plants known to European settlers. It has tremendous appeal for scientists and gardeners because of its beauty and carnivorous habits. This precious element of our natural heritage is declining, as are many other native plants." Having plant specimens available for study, whether in person or, increasingly, online, plays a crucial role in conservation efforts, in part because they document the species that have historically been found in a region. Understanding the plant life of a region is a necessary first step in preserving it. "Knowledge gained from the study of plant collections has helped to guide and prioritize land conservation from the past to the present day," Weldy said. "Botanical collections are an increasingly important tool to understand climate change and how species have shifted about the landscape. Herbarium collections are the libraries documenting the natural world around us." There is a mis-statement regarding the specimen pictured - Sarracenia purpurea purpurea is neither endangered or threatened. I may be locally rare, but the sp. has a vast range and is not in danger of extinction. There is a subspecies of this sp. that is threatened. It does not occur in New York.